Celebrating the life of Lucille T. Wihsmann "Lucy"
Obituary for Lucille T. Wihsmann "Lucy"
Lucille “Lucy” Theresa Wihsmann (nee Schultz) age 96, of Port Washington, formerly of Hartford, Wisconsin passed away peacefully with her loving family at her side on Monday, January 14, 2019. Lucy was born on May 28, 1922 in Milwaukee, WI to Joseph and Pearl (nee Kazmircak) Schultz. She was united in marriage to William “Red” F. Wihsmann. 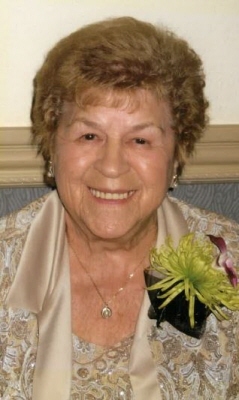 She was a long-time member of St. Kilian Catholic Church in Hartford and was a member of the Christian Mothers. Lucy loved Roller Skating, Dancing, Bingo, Owls, Betty Boop, Elvis, and the Packers, but most of all she loved her family. Lucy is survived by her loving children, Robert “Bob” (Jean) Wihsmann, Antoinette “Tootie” Wihsmann, Cheryl “Cherrie” (Gary) Muchka; cherished grandchildren, Cheryl (Tracy), Shannon (Ryan), Annette (Mike), Raquel (Matthew); cherished great-grandchildren, Jonathan, Keegan, Tristan, Cullen, Karissa, Devon, Breckin, and Ever; great-great grandchildren, Nathan and Graham. She is further survived by nieces, nephews, and other loved friends. She is preceded in death by her parents; beloved husband of 45 years, William; dear sons, William “Bill” and Bruce; dear siblings, Amanda, Joe, Ed, Angeline, Frank, Dolores, and Sylvester. Funeral Services for Lucy will be held Saturday, January 19, 2019 at 11:30 at the Shimon Funeral Home (824 Union Street Hartford, WI 53027) with Fr. Mike Petrie officiating. Family will greet relatives and friends at the funeral home on Saturday from 10:30- 11:30. Private interment in Holy Cross Cemetery, Milwaukee, WI. In lieu of flowers, memorial contributions to St. Vincent De Paul (52 S. Main St. Hartford, WI 53027) are appreciated. The family would like to express their heart felt thank you to the staff at Anita’s Gardens in Port Washington. To send flowers or a remembrance gift to the family of Lucille T. Wihsmann "Lucy", please visit our Tribute Store. "Email Address" would like to share the life celebration of Lucille T. Wihsmann "Lucy". Click on the "link" to go to share a favorite memory or leave a condolence message for the family.